I grew up with John Candy and Dom DeLuise movies. Their silly performances appealed to me as a kid on a very rudimentary level. They’re big, fat comedians who managed to get a laugh through their awkward yet charming comedic styles. And I’m going to compare some of the interesting similarities they shared during their acting careers. John Candy has an ingratiating comedy style. He might embarrass himself or look like a yutz at times, but his smile and infectious laugh always win the audience over. Even when he’s in over his head, he always has just enough self-confidence and easygoing charm to make us root for him. 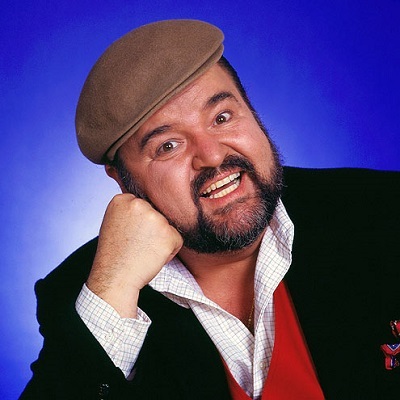 Dom DeLuise is more known for his distinct voice and wheezy, breathless moments of exasperation. He comes across as a man (or crow or cat or dog) at the end of his rope, which makes him very funny to watch. Somehow he usually comes across as full of desperation without being desperate for a laugh, which is no easy task to pull off. John Candy played second banana to a number of great actors over his career. He played opposite Tom Hanks in Splash and Volunteers, Steve Martin in Planes, Trains, and Automobiles, and Richard Pryor in Brewster’s Millions, just to name a few. Dom DeLuise appeared in numerous roles with his friend Burt Reynolds, ironically beginning with 1978’s The End, and then continuing with Smokey and the Bandit II, The Cannonball Run, The Best Little Whorehouse in Texas, Cannonball Run II, and All Dogs Go to Heaven. And then there were his films with Gene Wilder, The Adventure of Sherlock Holmes’ Smarter Brother and Haunted Honeymoon. There were no small parts for Candy and DeLuise because they always stood out as some of the best parts of their respective movies, even when pulling supporting duties. Both of these actors got to play a small part in the Muppet phenomenon of the ‘70s and ‘80s. John Candy had a cameo in the 1987 Sesame Street movie Follow That Bird! while Dom DeLuise had a cameo in the original 1979 The Muppet Movie. It’s just a funny coincidence. John Candy’s two forays into animation are the cerebral Heavy Metal and the awesome film The Rescuers Down Under. He was in the process of recording his voice for a Native American character in Disney’s 1995 animated film Pocahontas when he died, and his character was cut from the film as a result. Dom DeLuise had a much more expansive career in animation. He had memorable roles in many of the great Don Bluth films, including The Secret of NIMH, An American Tail, and All Dogs Go to Heaven. He returned to provide his unique voice talent for the many sequels to each of these films. He also starred in the atrocious A Troll in Central Park and The Magic Voyage. Oh, and let’s not forget the perfectly decent Oliver & Company. Both of these actors elevate the material they’re given. Candy is a big part of why The Rescuers Down Under works so well compared to the surprisingly dull original Rescuers film. Wilbur is so put-upon and hilarious. He keeps getting left behind by the heroes for one reason or another, but even when he’s left all by himself he still finds a way to steal the show. And DeLuise’s bumbling Tiger is almost the entire reason why An American Tail: Feivel Goes West is such an engaging sequel. Every one of his animated roles is memorable, even if they’re not all in the service of great films. It’s admirable that he kept returning for sequels so there would at least be continuity in that way. In 1989, John Candy starred in the quite excellent (but often overlooked) comedy Who’s Harry Crumb? In 1971, Dom DeLuise appeared in Who Is Harry Kellerman and Why Is He Saying Those Terrible Things About Me? He wasn’t the top-billed star of that film, but it’s still a fun coincidence that they both appeared in films with similar titles – at least at the start. Even great comedians can sometimes give great dramatic performances. And these two are no exception. John Candy did a superb job in Only the Lonely and he also had a small role in JFK. Dom DeLuise also played a small part in one of my favorite suspense films of all time, 1964’s Fail-Safe. That was very early in his career while Candy’s two dramatic turns were late in his, so it’s not exactly a fair comparison. Each of these actors had their favorite filmmakers to work with. 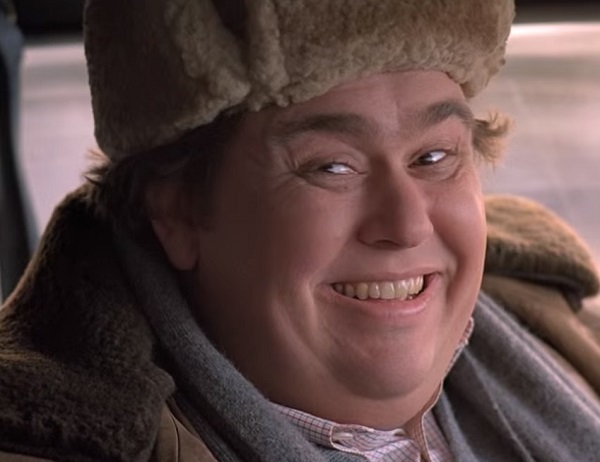 John Candy appeared in a number of John Hughes movies, besides the aforementioned Planes, Trains, and Automobiles, including National Lampoon’s Vacation, The Great Outdoors, Uncle Buck, Home Alone, and Only the Lonely (which Hughes didn’t write, but he executive produced for Chris Columbus). I already mentioned Burt Reynolds and Don Bluth, but there’s one more name that deserves to be mentioned along with them when talking about Dom DeLuise: Mel Brooks! DeLuise was a Brooks staple through most of his directorial career. DeLuise had notable turns in The Twelve Chairs, Blazing Saddles, Silent Movie, History of the World, Part 1, and Robin Hood: Men in Tights. In fact, he even starred in the one and only film that Brooks’ late wife Anne Bancroft wrote and directed: the not-so-flatteringly titled Fatso. “Barf. Puke. Whatever! Where’s my money?” Doesn’t it sound like Dom DeLuise flubbed the line and is just demanding his paycheck for the brief cameo? No, I’m just kidding. It’s a fun scene that demonstrates that even when both actors are covered in gobs of makeup, their comedic timing still shines through. All good things must come to an end. John Candy sadly died of a heart attack in 1994 at the age of 43. His career as an actor was still going pretty strong until the end. He had memorable turns in Rookie of the Year, Only the Lonely, and Cool Runnings in the years leading up to his death. We’ll never know if he would have continued to make good films or if he would have faded into obscurity as time went on. Dom DeLuise unfortunately lived to see himself fade into obscurity. After a brief cameo in 1994’s Robin Hood: Men in Tights, the only other notable role he had was in 1999’s Baby Geniuses – and that film was truly awful. He died of liver failure at the age of 75 in 2009. Even though they’re gone, we’ll always have their larger-than-life comedic performances to remember them by. This entry was posted in Movie Matchups and tagged actors, animated films, comedy, dom deluise, don bluth, films, john candy, john hughes, mel brooks, movies. Bookmark the permalink. I loved Spaceballs, and didn’t realize Dom DeLuise was in it. Nice! I’m glad I could fill you in on that little detail.